(1) ECB. The ECB plans to start buying corporate bonds in June. When ECB President Mario Draghi was asked at his press conference on Thursday, April 21, whether the ECB is considering buying corporate shares too, he said there are no plans to do so. Of course, by buying corporate bonds, the ECB is benefitting share prices by providing companies with a more liquid market for their bond issues, with yields likely to be lower than before the ECB entered the market. In fact, while the ECB can buy government bonds issued by the members of the Eurozone only in the secondary market, and not in the primary market for new issues, there is no such restriction for the ECB’s corporate bond purchases, with the central bank buying as much as 70% of individual issues. So the ECB can be an extremely important financier for Eurozone corporations. (2) BOJ. On January 29, the BOJ shocked and awed financial markets by introducing negative interest-rate policy (NIRP). Recently, there were rumors that the central bank is considering helping banks to offer negative interest-rate loans (NIRLs). More shocking and awesome has been the BOJ’s low-key purchases of stocks. One of our savvy accounts sent me an email early Monday morning with a terse message: “Doha: Ha, Ha!” He correctly predicted that there wouldn’t be a deal over the weekend to freeze oil production. Apparently, he wasn’t alone. Lots of traders must have shorted the oil market last week expecting no deal. The nimble ones must have covered their positions quickly Monday morning on the initial swoon in the oil price; after the low made on the open of the regular session, a rally swept the price north to close down only 0.4%. Giving the market a boost on Monday was news that Kuwait’s oil workers went on strike to demand more pay. On Wednesday, oil prices fell in the morning as oversupply worries returned after Kuwaiti oil workers ended their three-day strike and American Petroleum Institute data indicated a larger-than-expected build in US crude inventories last week. By Wednesday afternoon, prices hit new 2016 highs after the US Energy Department (DOE) reported a smaller-than-expected US crude build, which more than offset glut worries stirred by the end of a Kuwaiti strike. (1) Production. The Saudis are threatening to increase their production. So are the Russians. 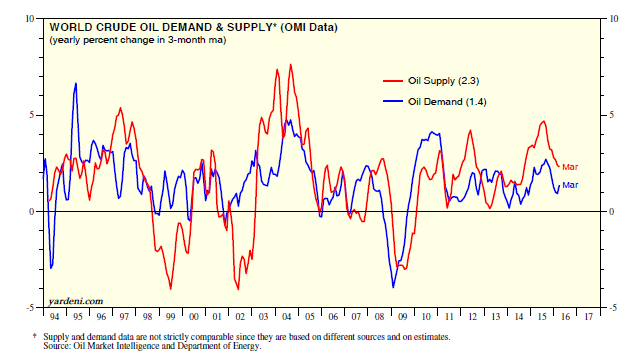 On the other hand, everyone is waiting for US oil production to decline in reaction to the plunge in oil prices. However, the rebound in prices since the start of the year might allow many US producers to keep pumping. 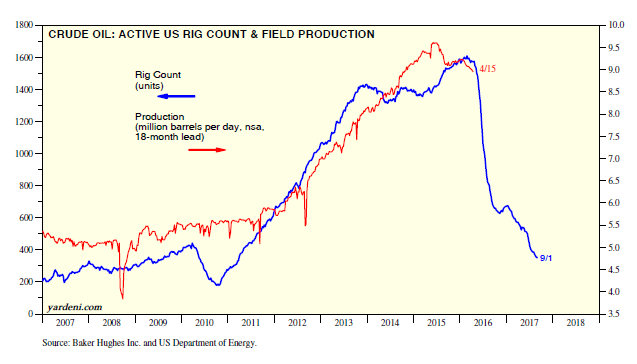 The bulls are taking comfort from a chart showing that the US oil rig count leads oil field production by roughly 18 months. 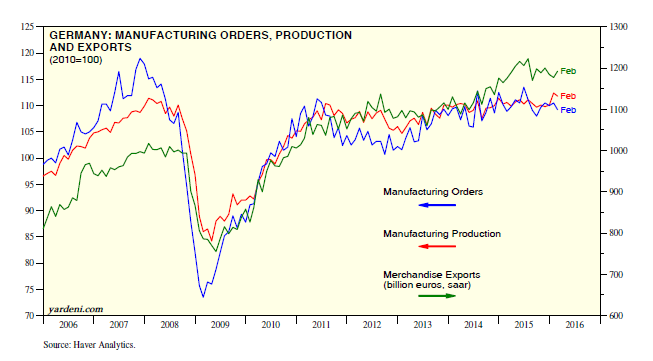 This relationship suggests an imminent plunge in US output. So does the relationship between US oil field production and railcar loadings of chemicals and petroleum products. On the other hand, US frackers have DUCs, or “drilled but uncompleted” wells. “When oil prices started their long slide in mid-2014, many producers kept drilling wells, but halted expensive fracking work that brings them online, waiting for prices to bounce back,” Reuters explained on 3/21. As the price of oil increases, drillers can easily bring those uncompleted wells online. “Wood Mackenzie reckons that the backlog of excess DUCs will decline over the next two years, and return to normal levels by the end of 2017,” the article states. This ready-and-waiting supply in the wings is likely to keep crude oil prices closer to today’s levels than north of $100 per barrel. I agree with this conclusion. Meanwhile, data compiled by Oil Market Intelligence (OMI) show that during March, crude oil output in the US and Canada combined rose to a record 13.6 million barrels per day (mbd). Russian and Saudi production remained in record-high territory at 11.4mbd and 10.2mbd. The same can be said of Iraq’s output at 4.3mbd. Iran’s production was up 0.7mbd y/y to 3.3mbd during March, with the country aiming to increase it to 4.0mbd before considering joining other suppliers in “re-balancing” the market. Even if there was no secret deal to weaken the dollar and stabilize world markets at a meeting of Group of 20 finance chiefs in Shanghai six weeks ago, currency and stock markets seem happy to play as if there was. ... In the weeks since, the three big headaches of the past year--China's yuan, falling oil prices and the threat of a stronger dollar and higher U.S. interest rates--have eased. In response, emerging markets have steadied, stocks and oil are not falling as fast and China's currency reserves, the cause of a huge global sell-off in early January, are rising again. It looks almost as if someone planned it. The article proceeded to report why such a secret agreement was unlikely to have occurred: "China's vice finance minister last month also denied the existence of a secret agreement with Washington. 'The more conspiracy oriented sides of this are fairly unlikely,' former U.S. Treasury chief Larry Summers told an event in Washington this week. 'It is just not the way that they (central banks) work.'" One concern pertains to the pace of global growth, which is importantly influenced by developments in China. There is a consensus that China's economy will slow in the coming years as it transitions away from investment toward consumption and from exports toward domestic sources of growth. There is much uncertainty, however, about how smoothly this transition will proceed and about the policy framework in place to manage any financial disruptions that might accompany it. These uncertainties were heightened by market confusion earlier this year over China's exchange rate policy. Interestingly, in a 4/5 speech on the global economic situation, IMF Chief Christine Lagarde mentioned China five times, noting that its economy was slowing. She also observed: "Following turbulence at the beginning of this year, economic sentiment has improved--driven by further easing from the ECB, an apparent shift to a slower pace of rate increases by the U.S. Fed, a relative firming of oil prices, and lower capital outflows from China." That certainly sounds like the G20 finance ministers' ideal outcome following their meeting. You decide whether it was a lucky coincidence or a conspiracy. In any event, the downward pressure on the Chinese yuan started around mid-2014, about the same time as the dollar started to soar on mounting expectations that the Fed would soon start raising interest rates while the ECB and BOJ were going the other way. The situation might have been exacerbated by Chinese companies that had borrowed in dollars and were scrambling to get dollars to pay off those debts in order to borrow at home instead. In recent years emerging markets companies in general--and Chinese groups in particular--have dramatically increased their dollar debts. The Bank for International Settlements calculates this now stands at $4,000bn for emerging markets as a whole, four times higher than in 2008. A quarter of this debt has emanated from China. Until lately, using dollar-based markets to issue bonds or take loans seemed a smart strategy for Chinese groups. After all, the US Federal Reserve has kept dollar rates at rock bottom lows and the renminbi has strengthened against the dollar in the past decade. But now the US interest rate cycle has turned and the renminbi has weakened. Moreover, contrary to assurances made in Davos by China’s most senior regulator that Beijing is committed to maintaining a stable currency, most delegates I have spoken to expect the renminbi to fall 10-15 per cent against the dollar in the next year. From the perspective of Chinese officials, the Shanghai conspiracy makes sense. They wanted the US dollar to stop soaring, and figured that would happen only if the Fed backed off hiking rates. Their off-the-record Davos chatter confirms that they were threatening to devalue their currency if the Fed persisted. Meanwhile, Fed officials finally seem to have realized that a soaring dollar is not good for the US economy. So the Shanghai “deal” (whether it was a coincidence or a conspiracy) made sense for both the US and China. By the way, another coincidence is that the yuan stopped falling as Chinese capital outflows slowed. The yuan fell to this year's low on January 7, and is up slightly since then. China's non-gold international reserves edged up by $11 billion during March after dropping $788 billion from the record high of $4.0 trillion during June 2014. Over the 12 months through February, China's reserves fell $594 billion while the country's trade surplus totaled $591 billion, implying capital outflows of nearly $1.2 trillion. It's not obvious what caused the outflows to suddenly stop in March. Maybe it was a conspiracy. The good news is that the recovery continues; we have growth; we are not in a crisis. The not-so-good news is that the recovery remains too slow, too fragile, and risks to its durability are increasing. Certainly, we have made much progress since the great financial crisis. But because growth has been too low for too long, too many people are simply not feeling it. This persistent low growth can be self-reinforcing through negative effects on potential output that can be hard to reverse. The risk of becoming trapped in what I have called a ‘new mediocre’ has increased. China’s transition to a more sustainable economic model--which is good for China and the world--means that its growth rate, while still strong, is lower. There is a consensus that China’s economy will slow in the coming years as it transitions away from investment toward consumption and from exports toward domestic sources of growth. There is much uncertainty, however, about how smoothly this transition will proceed and about the policy framework in place to manage any financial disruptions that might accompany it. Downturns in Brazil and Russia are larger than expected. The same is true for the Middle East--hit hard by the oil price decline. Many African and low-income nations also face diminished prospects. These frustrations are leading people to question established institutions and international norms. To some, the answer is to look inward, to somehow unwind these linkages, to close borders and retreat into protectionism. In addition to these “supply-side measures,” she wants to see more fiscal spending on infrastructure everywhere, and she is all for a continuation of ultra-easy monetary policies, including negative interest rates. There was no mention in her speech of true supply-side measures like cutting taxes and reducing government regulations. 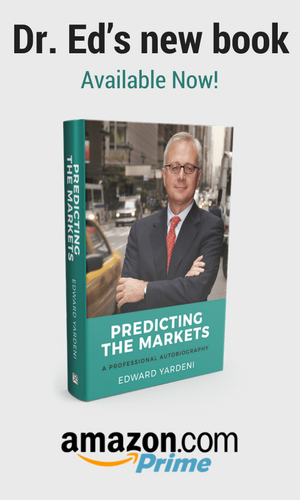 I have been monitoring the subpar pace of global economic growth for the past few years. I’ve characterized it as “secular stagnation.” The IMF chief prefers to call it the “new mediocre.” She thinks that more government can end the mediocrity. I think that it is too much government that got us into this mess in the first place. (1) US. The Atlanta Fed’s GDPNow model forecast for real GDP growth (saar) in Q1-2016 was lowered to 0.4% from 0.7% on April 1 following the release of relatively weak auto sales data for March. The forecast remained at 0.4% after April 6's merchandise trade report. Real imports rose more than real exports during February, with the former up 6.8% y/y, while the latter was up just 0.5%. February’s nondefense capital goods orders excluding aircraft fell 2.5% m/m and 0.7% y/y. 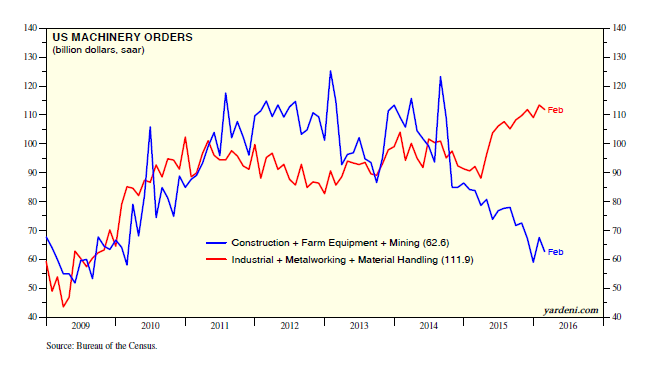 Among machinery orders, the strength in demand for industrial, metalworking, and material-handling equipment continues to be offset by weakness for construction, farm, and mining gear. (2) Eurozone. There have also been a few strong and weak economic indicators in the Eurozone lately that add up to a mediocre mix. The volume of retail sales excluding motor vehicles rose 2.4% y/y to a cyclical high that matches the previous record high during February 2008. However, German factory orders fell 1.2% m/m and were basically flat with last February’s level. German manufacturing output also fell during February by 0.5% m/m but is up 1.2% y/y.